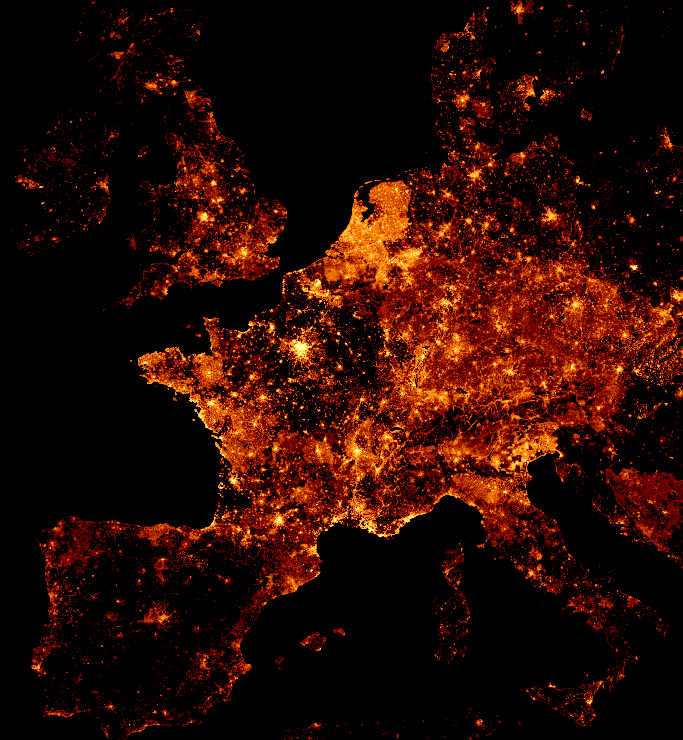 Happy 10th birthday, OpenStreetMap! | goFLOSS! News, thoughts and tinkering from the Free, Libre and Open Source world. 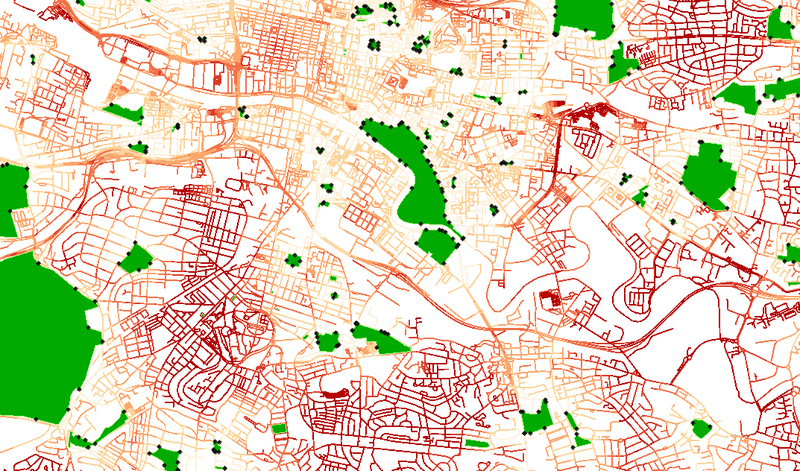 OpenStreetMap (OSM) is a open data project focused on mapping our entire physical world. Just a few days ago, the project turned ten. Welcome to OpenStreetMap, the project that creates and distributes free geographic data for the world. We started it because most maps you think of as free actually have legal or technical restrictions on their use, holding back people from using them in creative, productive, or unexpected ways. OSM started on the 1st of July 2004. I started helping out as a simple local contributor almost three years ago, and I have closed more than 200 changesets. It isn’t much, but I feel like I am doing my bit for an amazing project. I sort of moved from Wikipedia to OSM as the open knowledge project I contribute the most to, although I never really stopped editing Wikipedia. I might even focus on it again later on, who knows! 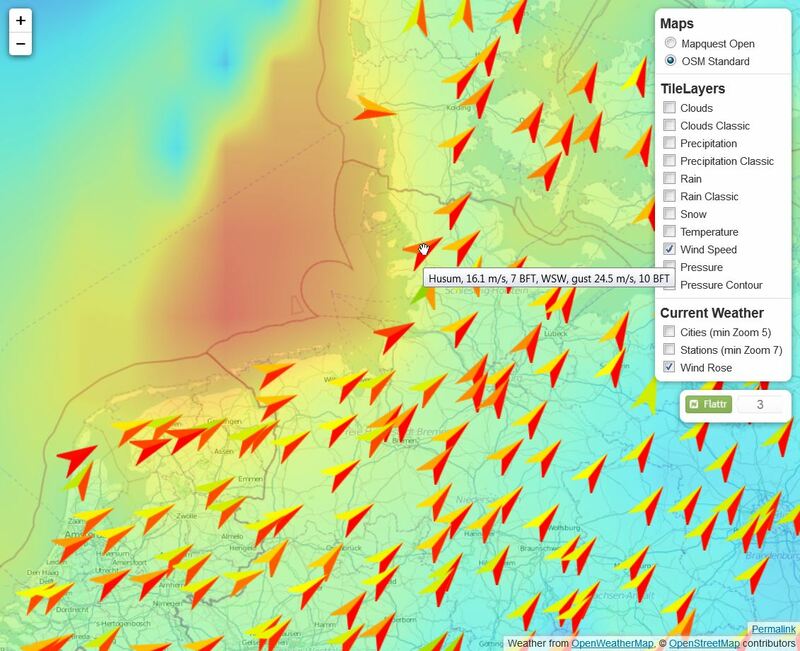 For the tenth birthday of this project I really love, here are a few random examples of the great thing that the freely available data OSM offers lets people do and create, just in the two last years. Another example would be OpenBeerMap, a project I wrote about recently. I gathered them (with their captions) from the great selection of images offered by the Featured Images page on the wiki. Click on the pictures for more details. 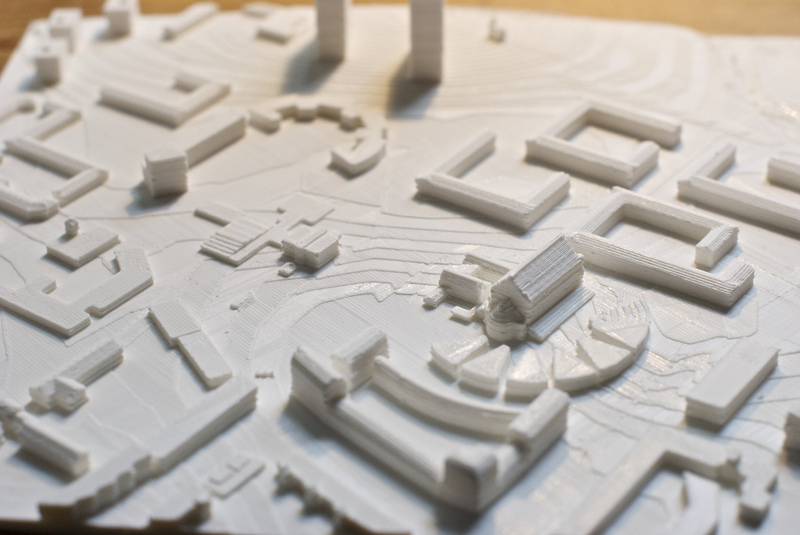 3D printed model of the Gorbals, Glasgow, location of the Commonwealth games 2014. Created using osm2world to convert from .osm to 3D and SRTM elevation data. Printed using a Ultimaker 2. HOT (Humanitarian OSM Team) is coordinating mapping efforts for the Ebola outbreak in West Africa. 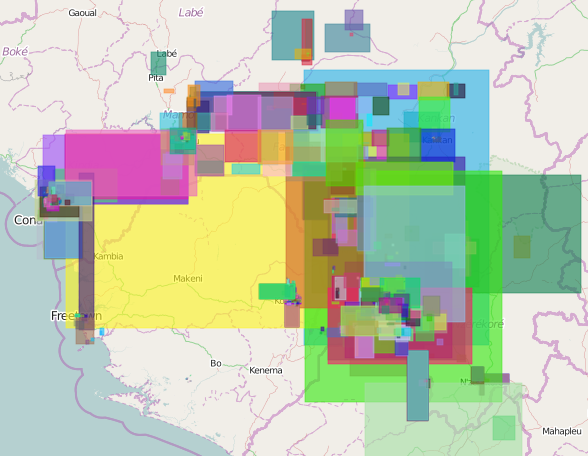 The map shows all changesets with #HOT in and around Guinea. The tool visualises changesets of the last seven days with a certain comment. HOT coordinates humanitarian mapping projects depending on what happens around the world, and often helps others do a better job at delivering aid on site after major natural disasters of health issues. 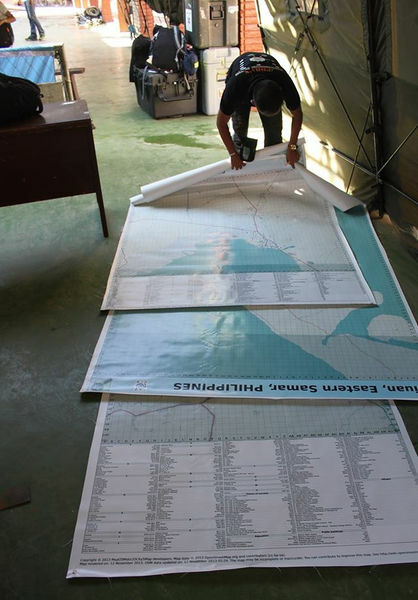 Large OSM-based poster maps of Tacloban, Guiuan and Ormoc printed and delivered by International Organization on Migration in DSWD Operations Center in Tacloban Airport. The maps will be used to coordinate the relief and rescue efforts for the victims/survivors of Typhoon Haiyan. 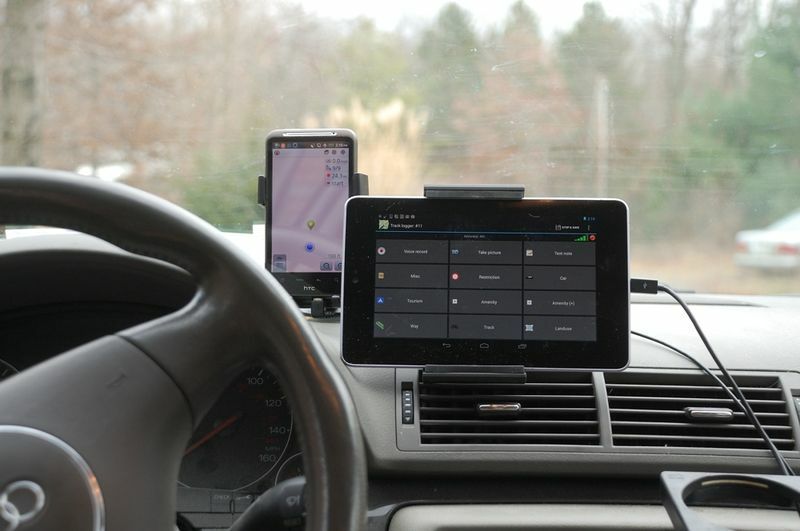 A car dashboard kitted out with gadgets. This is just one of a wide variety of mapping techniques. Visible here (left to right): A smartphone running OsmAnd (information and map display) and a tablet computer set up with OSMtracker (POI recording). 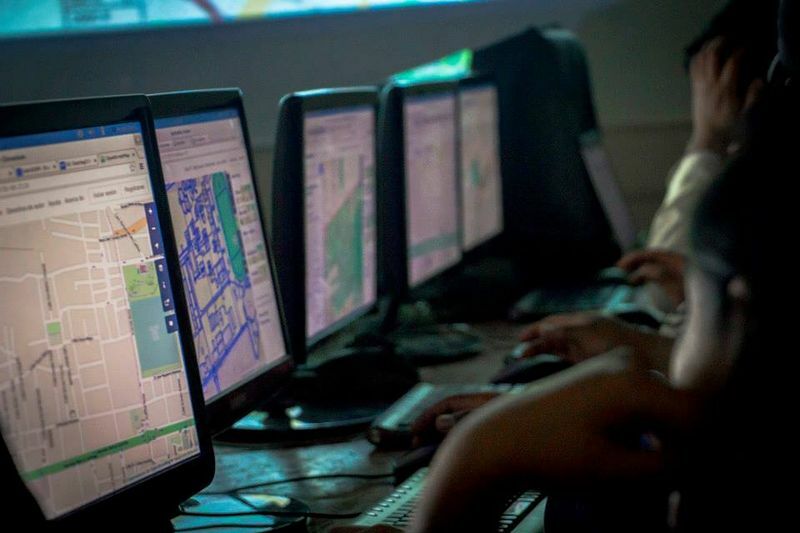 1st “OpenStreetMap Workshop from scratch” – a free and open event that brought together artists, cartographers, marketing companies and territorial planning/computer science students as part of the activities of the HackLabCocha in Cochabamba, Bolivia. View the full set of photos. 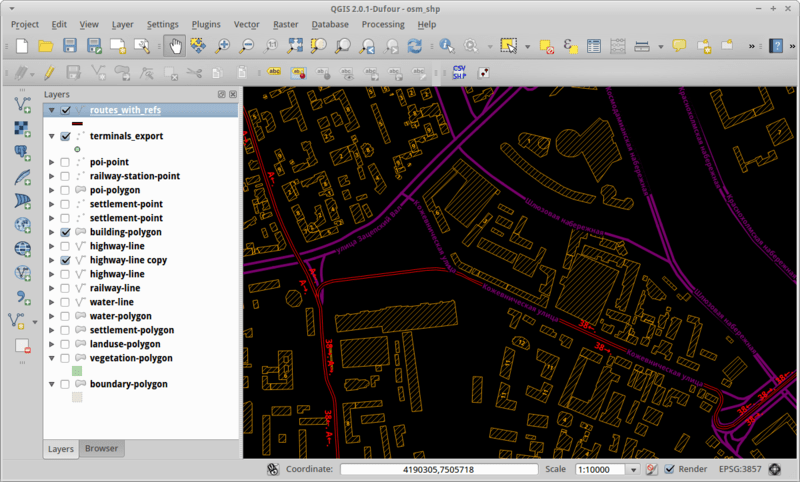 Viewing OpenStreetMap buildings and tram data within the open source QGIS software. The 2014 Olympics ski venues in the Krasnaya Polyana (Sochi) mountain cluster. This spontaneous mashup using Leaflet shows OpenSnowMap’s ski pistes and lifts on OpenTopoMap as baselayer on a slippy map. 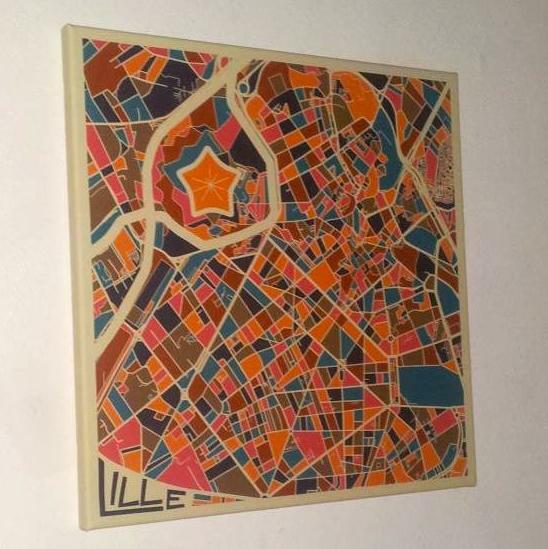 A colourful artistic map of Lille (France) with its characteristic star-shaped citadel, made using OpenStreetMap data and QGIS as described in the tutorial here. 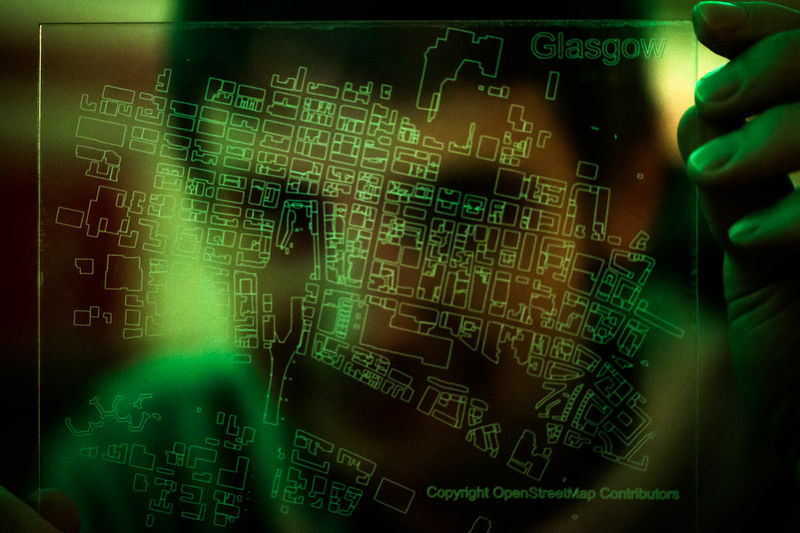 OSM contributor Hawkeye admiring his laser-etched acrylic map (bounding box at OSM.org) of OpenStreetMap buildings in central Glasgow, made at the MAKLab in The Lighthouse, Glasgow. 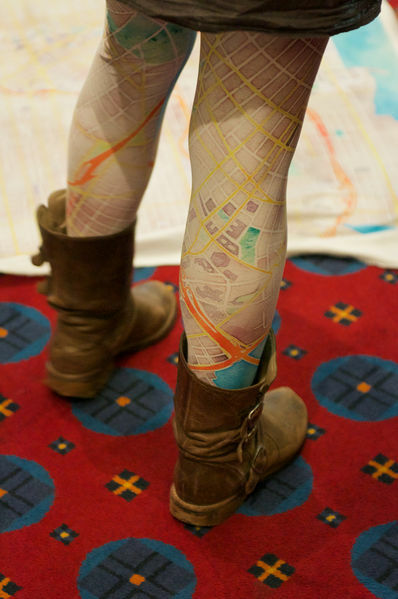 OpenStreetMap leggings. A prototype on show at State Of The Map U.S. 2012 of a new product from softcities.net. 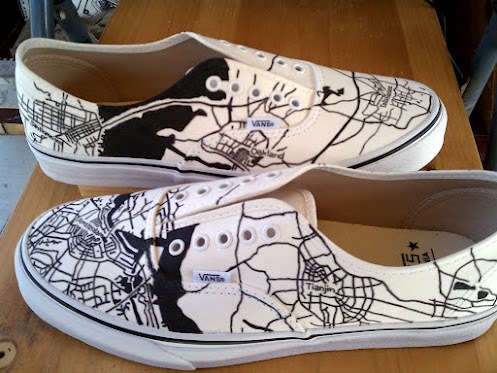 Maps copied onto shoes (by tracing over a projector image). 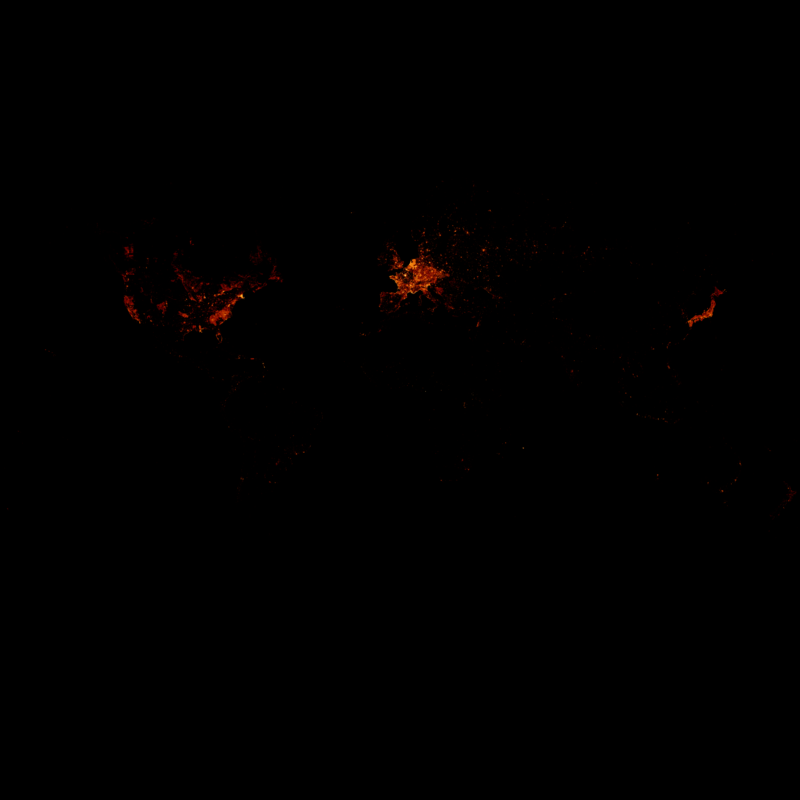 No volcanic eruptions, no wildfires, but burning passion of OpenStreetMap volunteers – represented by a map showing the colourised node density of OpenStreetMap data. 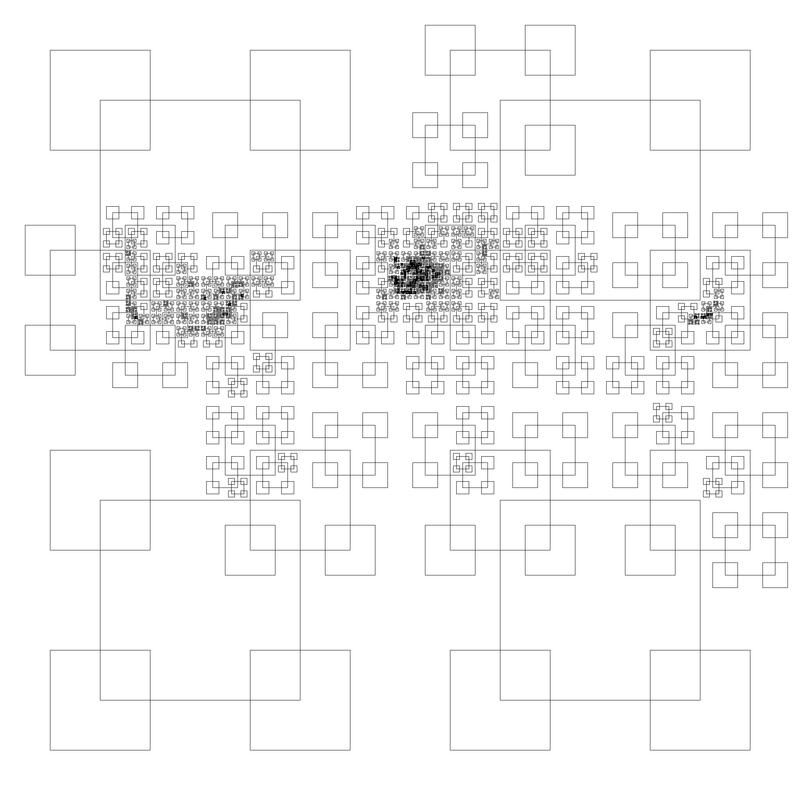 Alternative views: full world as slippy map, full world as single image (67 Mpx, 1 MiB); full world scaled down, more info how this was created. 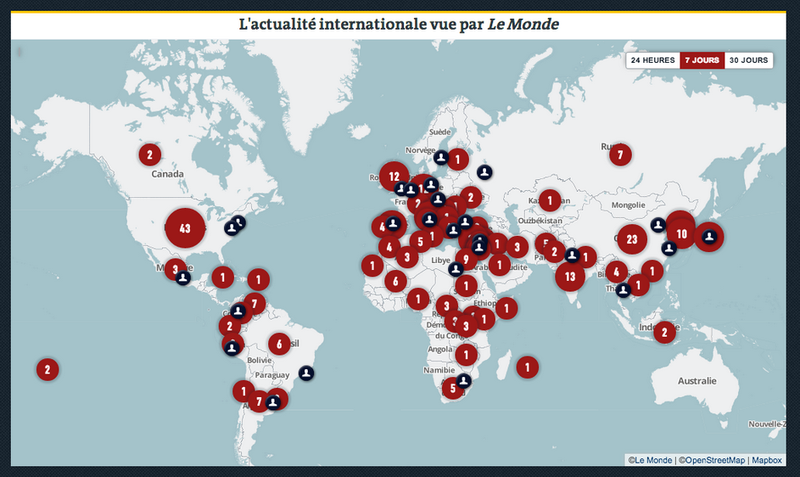 Le Monde, one of the largest French newspapers, relaunched their online paid edition with interactive French maps powered by OpenStreetMap. Read more on the MapBox blog. 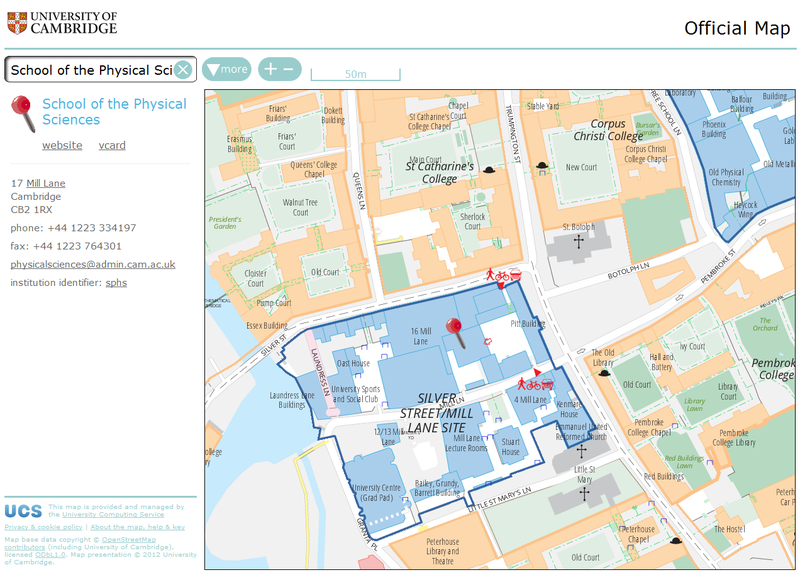 The University of Cambridge’s new online map was made live at http://map.cam.ac.uk in late September 2012 (and also linked from the University’s home page). This prestigious, year-long project has contributed lots of data to OSM and uses OSM data for its street index and custom renderings. Supertuxkart is a free, open-source racing game. Using 3D data from OpenStreetMap we can race around real-world street layouts, such as this suburb of Rostock. 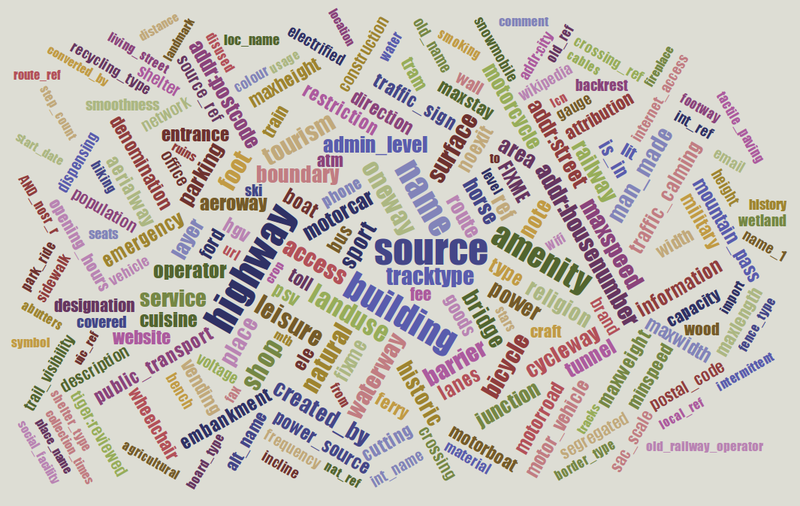 Taginfo shows what tags are used in the OSM database. Here, the size is correlated to the number of times the tags are use. This curious map of the world, shows the result of dividing the OpenStreetMap dataset into quarters until each of these vector tiles is less than 32MB in size. An experiment by Eric Fischer (details). Map showing distance from parks in Glasgow, using openstreetmap data and GRASS/QGIS network analysis. Dark red means further away from a park. The “Surging Seas” map blends OpenStreetMap and aerial imagery to interactively simulate sea level rise due to climate change. Here we see New York after a 10ft rise, the maximum setting. 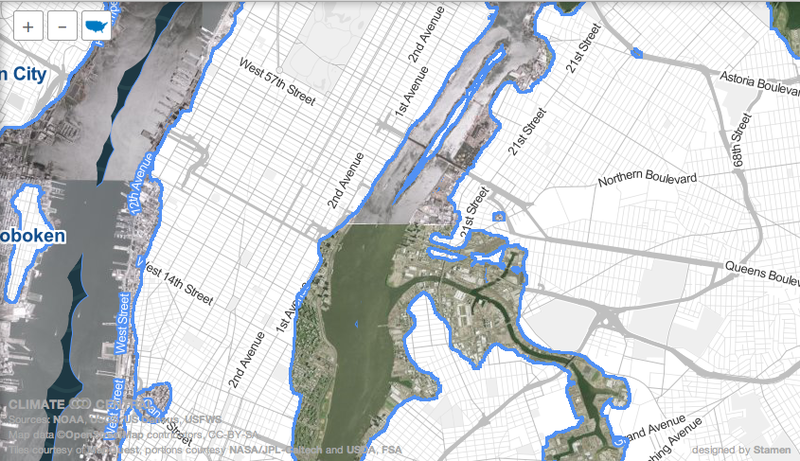 The storm surge of Hurricane Sandy brought a rise of up to 13ft. Students from Azores Islands, Portugal, visiting Germany on a training course in JOSM and QA Editor as part of the Life Long Learning Mapping Project. Team from the Université Cheikh Anta Diop after a five day training course in AUF Dakar. 23 students and researchers focussed on mapping the Medina municipality of Dakar, Senegal. See the HOT blog write-up by Augustin Doury. 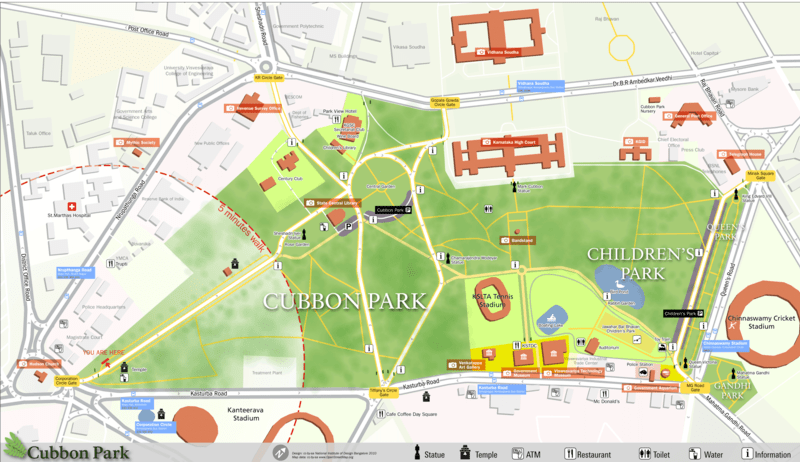 Pedestrian Map for Cubbon park, Bangalore, created as part of a class project at NID. Students developed a system of navigation and wayfinding for visitors to the park. Data was collected using Walking Papers, added to OpenStreetMap, and then exported and processed in Adobe Illustrator for the final output. Students and teachers from five countries meet in Saarburg, Germany to learn how to gather data, use mapping devices, feed in and maintain the OSM data. 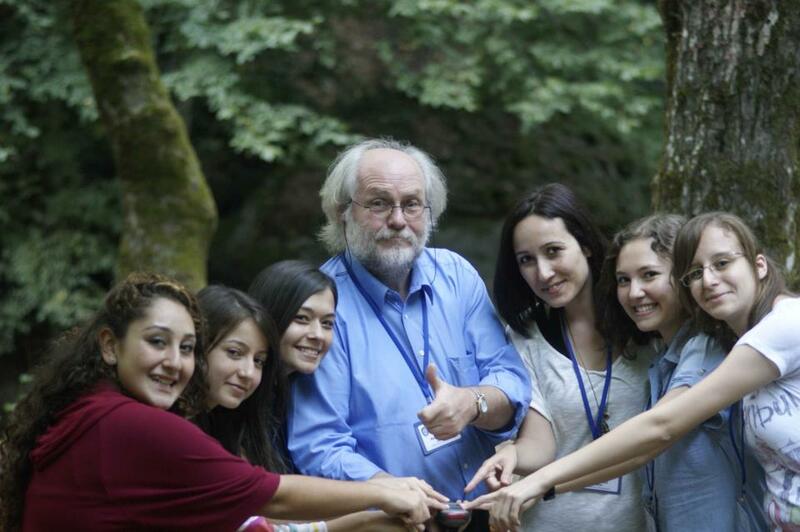 Meetings in Portugal, Slovenia, Romania and Turkey will follow as part of this two year EU funded Comenius project. 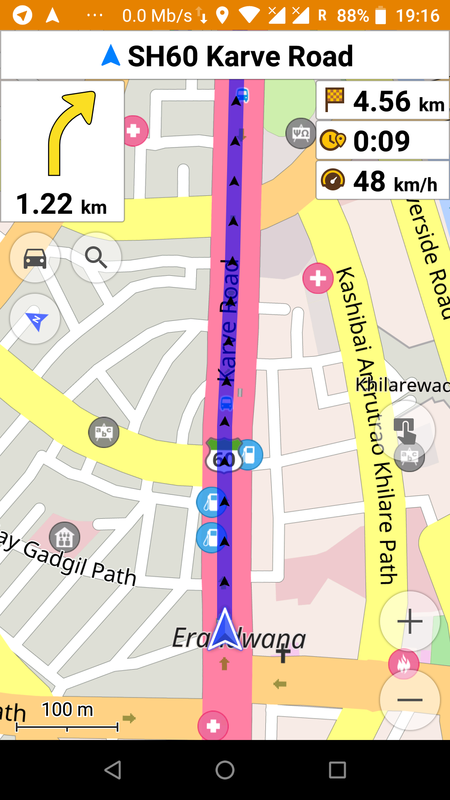 One of the many apps available for navigation purposes, this is a screenshot of OSMAnd on an Android phone. Obviously, there are many more great things to be said about this project and the data’s many uses. If you want to help make this this great project grow, feel free to have a look at the beginner’s guide on the wiki and navigate the rest of the pages to learn more. You can also ask questions on OSM help. (With more than 7000 questions, it is likely yours is already answered!) But you can also go straight to the main website, create an account and click “edit” to contribute your local knowledge to you area’s map! ← OpenBeerMap: what beers are offered nearby? Why is Clementine my favourite music player? goFLOSS! by Stéphane Guillou is licensed under a Creative Commons Attribution 3.0 Unported License.